What Is the Best Way to Learn to Dance? Trying to decide on private lessons vs group classes can be tough! Check out the pro and con list below to help make your choice! We always suggest students do both, since some of the elements of private lessons you will miss in group classes and vice versa! 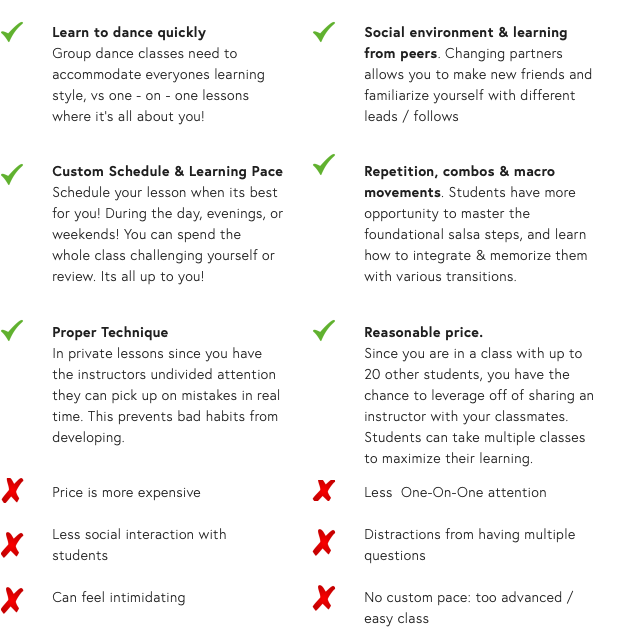 The ideal combination is 1 private lessons : 2 group classes : 3 hours of social dancing but every case is different, depending on your goals & learning styles! With the holidays approaching we wanted to share of our favourite "pamper your favourite dancer" gifts! We have included a handful of ideas, where you can find them in the Hamilton area, and what our favourite thing to purchase there is! Dance class is a wonderful environment to learn not only the in's and out's of the Salsa world, but its a great spot to brush up on etiquette! Since Salsa dancing is a true contact sport, it is helpful to be mindful of the little things that help to make for an enjoyable time for all. Please be on time, and stay for the duration of the class. It is disrespectful & disruptive to the instructor and fellow students when students are coming in and out of class. Early is on time, On time is late, and late is unacceptable. Please be mindful of your body odour (wear deodorant & reapply if necessary), avoid excessive amount of cologne/perfume, and shower regularly. We suggest you keep makeup to a minimum as well, since sweating can cause it to run and sting your eyes. We offer spray deodorant, and mints please use them, and if need be, bring a towel :). Please remember that there is often lots happening in a dance class, exchanges with your partner are encouraged and are is helpful wen learning. Please keep them at a low volume (no one should hear you over the music), and refrain from talking when the instructor is explaining. Please keep in mind you will be moving and you will be dancing with a partner, attire must be respectful, and appropriate for dance class. We ask that you keep jewelry (earrings, rings, watches, necklaces etc) to a minimum to avoid any unnecessary injuries. If you wouldn't wear it to the grocery store chances are you shouldn't be wearing it to class. Students who come to class visibly under the influence of drugs or alcohol will be asked to leave. It creates a distracting environment for fellow students and takes away from their learning experience. Everyone has challenging days but dance class is the one place where students can put down the stress of daily life. Come into class with an open mind, positivity, and an encouraging attitude! This will not only make it a more enjoyable experience and help you to learn faster, but make it a better environment for all your partners and fellow students! We understand that learning to dance can be a vulnerable thing. It's brand-new, most people feel like they have 2 left feet, and everyone makes lots of mistakes when they first learning (just like anything new). It is imperative that all students feel welcome, regardless of age, gender, race, orientation, and/or everything in between! Please keep an eye out on your fellow students and if, or anyone you feel is having a bit of a hard time with partner dancing dynamic please let the instructor know! People come to dance for all kinds of reasons! Some are looking for a break from the stress of day to day life, some want to know what to do to look good on the dance floor, some people jump at the chance to meet new people. Why do you dance?